In the Carolingian Period (8th century), a feudal system was installed and Florence became a county of the Holy Roman Empire. 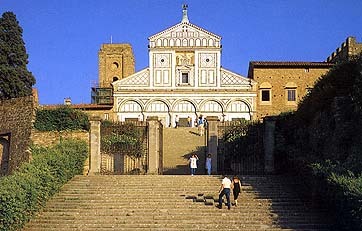 According to a tradition which was never abandoned and which comes down to us from the earliest Florentine chronicles, Emperor Charlemagne visited Florence and he donated Money and houses for the reconstruction of the primitive church of San Miniato (he did it in suffrage of is beloved bride Hildegard who died when she was 26 years old). Various facts seem to testify to a revival of the city in Carolingian times: in the 9th century a public ecclesiastic school was established in the city and the bridge over the Arno, which had been destroved during the Goto-Byzantine war, seems to have been rebuilt. Moreover at the turn of the century new city-walls were built, probably for fear of the Hungarian invasions. The new walls, the third set, partly fallowed the line of the old Roman walls, widening on the south to enclose the suburbs (borghi) which had grown up in the direction of the Arno (a sign that the city had grown) while to the north, for political reasons, the Baptistery, Santa Reparata, the Bishop's Palace, as well as the adjacent Palatium Regis where the Emperor's representative held his "court of justice", were excluded. Towards the end of the 10th century, Countess Willa, widow of the Marquis of Tuscany, who owned an entire district within the city-walls, founded and richly endowed a Benedictine abbey in memory of her husband: the "Badia Fiorentina". Countess Willa's son, Hugo, greatly contributed to the development of Florence thanks to his decision to leave Lucca. His choice of the city on the banks of the Arno as his dwelling place reinforced its administrative character.